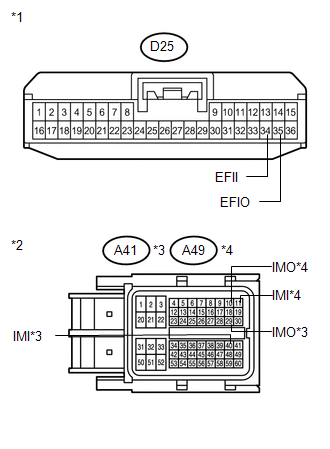 This DTC is stored when one of the following occurs: 1) the ECM detects an error in its own communication with the certification ECU (smart key ECU assembly); 2) the ECM detects an error in the communication lines; or 3) the ECU communication ID between the certification ECU (smart key ECU assembly) and ECM is different when an engine start is attempted. Before troubleshooting this DTC, make sure that no certification ECU (smart key ECU assembly) DTCs are present. If present, troubleshoot the certification ECU (smart key ECU assembly) DTCs first. If the certification ECU (smart key ECU assembly) is replaced, register the key (See page ). DTC B2799 is not output. (a) Re-register the ECU communication ID (See page ). (a) Turn the engine switch off. (b) Check that the connectors are properly connected to the ECM and certification ECU (smart key ECU assembly).